Hello all. First off I want to send out a big warm welcome to my newest Follower and Thank her for the comment love too. I made my 1st Valentine of this year this morning. It's going to a Card Making Friend who simply adores Owls. It was fun to make and I really am pleased with the outcome, what do you all think? Well time for lunch here. Taking MIL out today to a local eatery, to nice to be inside today. I think whoever is getting this card is going to LOVE it...it's adorable! Hi Chris I wanted to thank you so much for your lovely comment on my blog, I really appreciate you taking the time to visit me. I must tell you that this is totally fabulous what a superb design full of so much beauty this is an ACE creation. Chris, I got your email and came to visit! 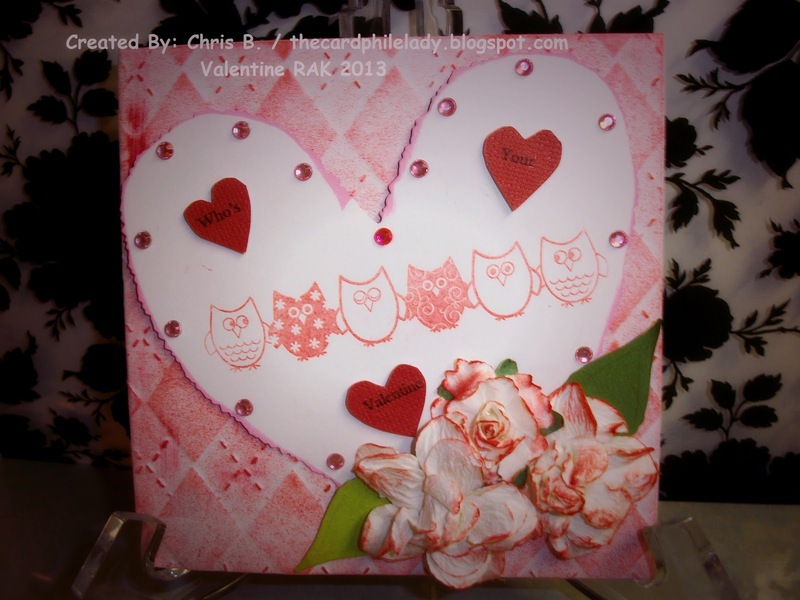 I LOVE this card, the owls are adorable and the lay out is so cute! Look for my email I'll be writing you back later tonight.